In 1975 Michael Hart wrote an influential article essentially restating the Fermi paradox, arguing that because we have not encountered aliens, or signs of aliens, we must be alone in the Milky Way. We have interstellar probes already — indeed today’s travel at more than 1/10,000 the speed of light. At these speeds, it would take them 1 billion years to cross the entire Milky Way, which is 1/10 of its age. Clearly, interstellar space travel is possible. This might be a perfectly adequate explanation of why, in the year 600,000 BC, the inhabitants of Vega III chose not to visit the earth. However, as we well know, civilizations and cultures change. The Vegans of 599,000 BC could well be… more interested in space travel. A similar possibility would exist in 598,000 BC, and so forth. Even if we assume that the Vegans’ social and political structure is so rigid that no changes occur even over hundreds of thousands of years… [this] still would not explain why the civilizations which developed on Procyon VI, Sirius II, and Altair IV have failed to come here. Indeed, sociological arguments must fail if intelligent space-faring life is common. Hart also lists the common “self destruction” hypothesis among these, but, as I have argued, large civilizations are essentially immortal, not vulnerable. Temporally, as Hart already argued, there has been enough time (this timescale for galaxy colonization is sometimes called the Hart-Fermi timescale). Unless some biological “phase transition” has just occurred in the life of the Galaxy (as Ćirković and Vukotić and James Annis have suggested) and we are at the beginning of a new era of space-faring races, we must contemplate why 10 billion years is not enough for aliens to arise and colonize the Galaxy. Indeed, because of the inherent velocity dispersion in stars and Galactic shear, even colonizing one nearby star is enough to create a huge linear distance across a civilization on the timescale of a Galactic rotation. Halo stars can provide the necessary slingshot velocities required for even slow-moving ships to reach nearby stars. Each colony is capable of sending out almost arbitrary numbers of colony ships, scattering them along their path through the Galaxy. This leaves two possibilities: we are alone, or the aliens are being missed in some way. My personal favorite of these is the “nature preserve” solution: we are no more aware of aliens than an anthill in some national park in Africa, far from where the tourists or poachers go is aware of humans. There is also the Zoo hypothesis (that we are in a zoo), the planetarium hypothesis (that astronomers are observing an elaborate illusion), the Prime Directive hypothesis (no contact allowed until we get warp drive), and so on. All of these basically argue that we are being tricked, or that there is some other reason we should not believe what we see. Hart rejects these on the grounds that they fail for the same reasons that the sociological arguments fail, but I disagree. I’ve argued that there should really only be one galactic civilization; who knows what the parts of it surrounding us would want to do with us? The unlikelihood of our isolation demands that we consider this, even if it is philosophically problematic. And that is where waste heat can overcome the limitations of Hart’s argument. The Milky Way is the single data point in Hart’s thesis. If we could repeat Hart’s experiment in other galaxies, then we could confirm or reject most of the solipsistic arguments (not the planetarium hypothesis, obviously). If we find that most other galaxies are filled with aliens, then it is possible that ours is as well, and we are being “preserved” in some way. If most other galaxies are devoid of aliens, then our probably is, too. In other words, by looking for the inevitable evidence of alien energy use in other galaxies, as opposed to their communications or their probes, or the aliens themselves, we can get around any attempt by our galaxy’s aliens to hide from us. Each galaxy we search forms an independent experiment in SETI, making waste heat searches highly complementary to signal searches. 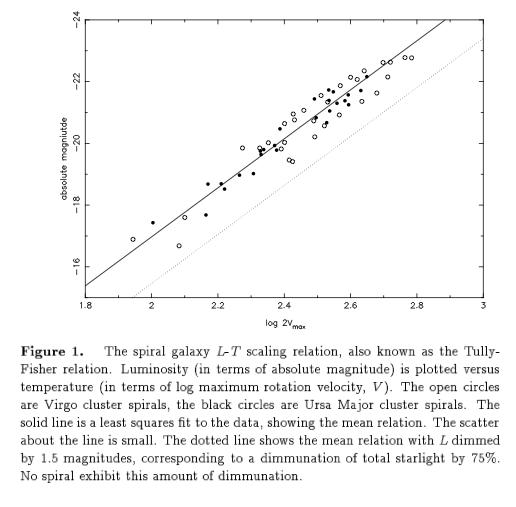 James Annis searched 137 galaxies for large mass-to-light ratios — that is, too much mass and not enough optical light (using the Tully-Fischer relation). Essentially, he was looking for low-alpha galaxies by using rotational speed as a proxy for mass, and so total stellar luminosity, and optical flux as a proxy for unblocked light. He put good upper limits on alpha for these galaxies (about 75%), showing that none was filled with a high-alpha K3 civilization (see his Figure 1, above). He argued that this means that the timescale for a K3 to arise per galaxy is greater than 300 billion years, and will grow with every galaxy we observe NOT to contain a K3. This also eliminates most of the final arguments in Hart’s list. Maybe not. My assumption that each galaxy is an independent test of the existence of K3 civilizations assumes that the travel time between them is prohibitive. If faster-than-light travel is possible, then the galaxies need not be independent at all. They could all be inhabited by an enormous “Type IV” Kardashev civilization, spanning all the galaxies we see (and not emitting any detectable waste heat). But I think that Annis’s search has been very important in moving us forward in resolving Fermi’s paradox: it breaks through many of the “just so” explanations for our apparent isolation and forces us to confront the three remaining options: We are alone, physics as we know it is wrong, or we’re missing some important practical limitation on travel and energy use. 1Hart actually includes most of Ćirković’s solipsist arguments under “sociological”, but I’ve reorganized them here. Hart’s 4th argument was basically “they’ve missed us”, which he properly disposes of quickly. This entry was posted in science, Uncategorized and tagged science on February 17, 2013 by jtw13.